This point is near the extreme northern end of Spencer Gulf in South Australia. The Australian Arid Lands Botanic Garden is to the left above the cliffs. 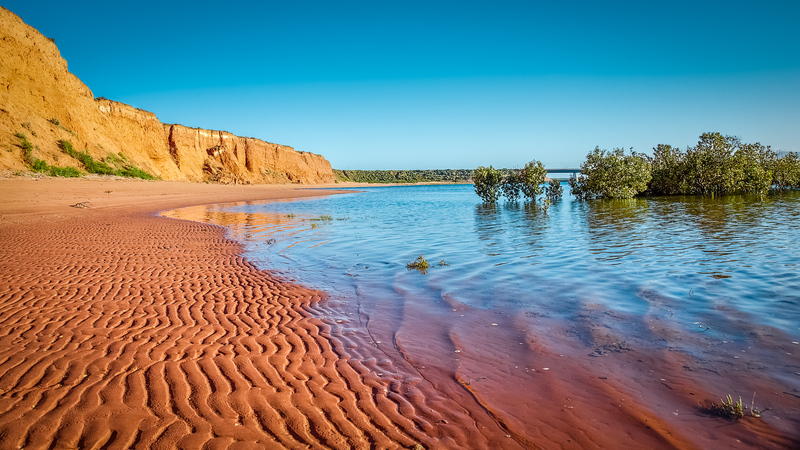 This area is at the beginning of the desert or the "Outback", in fact Port Augusta is dubbed "The Gateway to the Outback". You would need a car to get to this location early in the morning but check the opening time for the botanic garden. You need to get in there to park as near as possible to the north east corner of the park near the railway line. Walk north to the line then scramble down the cliff to the red sand beach. Be warned, water conditions vary depending on the tide and it can be very hot in summer.